The most historic, courageous and above all, patriotic step Cameroonians West of the Mungo took in their quest to right a colonial wrong was on 11 February 1961. On that day the former British Southern Cameroonians administered as a mandated territory of the UNO, went to the polls and with a landslide vote of 94 per cent opted for reunification with their kindred of the former French Cameroons. A total of 349,650 adults registered to decide the political fate of their country, 331,312 actually, went to the polls, and 233,571 voted for a reunion with their kindred east of the Mungo. In that referendum Only 94,471 former British Southern Cameroonians opted for integration with Nigeria. These figures speak for themselves. They portray glaringly the people’s longing to regain their unity despite 45 years of a geopolitical divide. What a sense of political maturity by a colonized people! After this first courageous, fraternal and patriotic step, on 1st October 1961 the decision was concretized when the separated compatriots regained their unity and became the Federal Republic of Cameroon. The former British Northern Cameroons in that pleblicite regrettably opted for integration with Nigeria. With these developments, Cameroonians and their wellwishers felt proud of a right decision taken at the right time. But some political observers considered it a fragile political experiment that would not last. However, the masterminds of these political changes believed that such a decision taken in the absence of a third option of achieving independence before reunification with the former French Cameroons or integration with independent Nigeria was a better alternative. 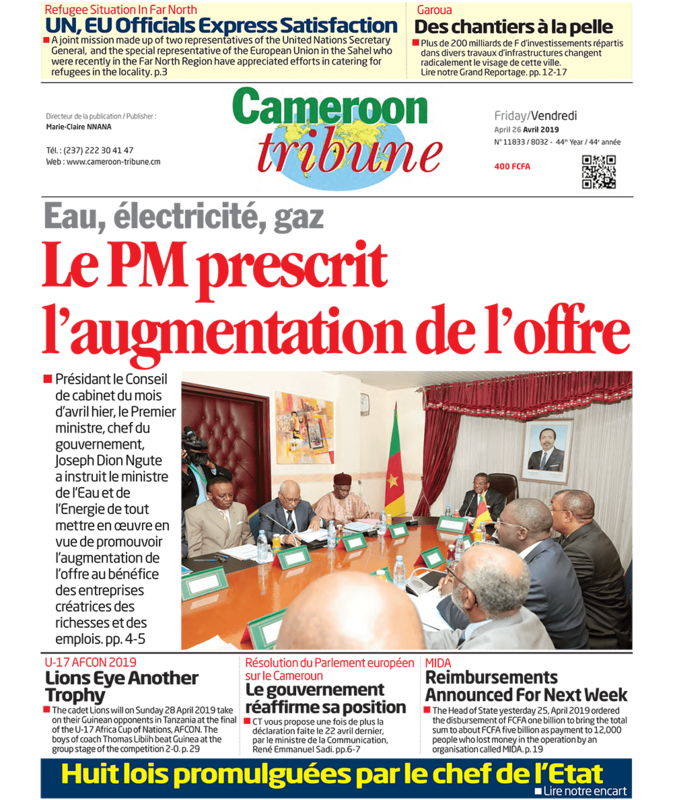 The main test of pratriotism since then has been the challenge to accept each other in a reunited Cameroon, protect, and preserve this reunion in respect the demands of nationhood. The former British Northern Cameroon which opted to integrate with Nigeria is today known as Gongola State. But it is consoling and politically mature to continue consolidating our national unity in order to ensure the peaceful coexistence at national international levels. After this political feat which has made Cameroon to earn for itself the titles of laboratory of African Unity, Africa in miniature and icon of peace, should we continue to undermine the ingredients of genuine unity, political stability and peace? Should we at a time when the International Community and world Powers are talking globalisation and New Millenium Development Goals ignore the truth that without unity and stability at national and regional levels our resources can hardly reap the desired devedends? In his address to Cameroon’s youths on the eve of this year’s youth Day Cellebration with the theme, “Young People and the Challenges of Building an Exemplary Indivisible Strong and Emergent Nation,” President Biya harped on the importance of sacrificial commitment for the sustenance of peace, love of the country, and national unity. As a leader aware of the credibility that stems, from listening to the people, with sustained efforts to weather the storms that deprive compatriots of their rights, President Biya in his address resounded the steps government has aheady taken to meet the needs of Trade Unions whose strike action has kept away from classes, pupils and students in secondary and Higher institutions of the North West and South West Regions. This, in effect is no longer just a North West and South West Regions’ problem. It concerns all Cameroonians. The Presidents’ pledge to continue to explore ways and means of effecting what he has already started to restore order in respect of children’s right to education was timely and fatherly. It was indeed a challenge to all Cameroonians who must together cooperate to weather this storm. If at individual and collective levels, citizens do not work with leaders to implement the decisions being taken, we would continue to complain while issues, move from bad to worse. In his address to the youths in parcular, and Cameroonians in general, President Biya made it clear that workers have have the right to seek what they need through strike action, but this must be done writh with order and discipline. For, with labour grievances stemming from human imperfections, it is only through efforts for correction by doing things the right way that the one who has the yam and the knife, can reflect and act in the interest of those affected. 11 February, the date devoted to youths on whose account the Head of State recounted our challenges, and the need to surmount them, should serve as a challenge for all Cameroonians to work with prudence and urgency to prevent the worst that threatens our unity, stability and progress.